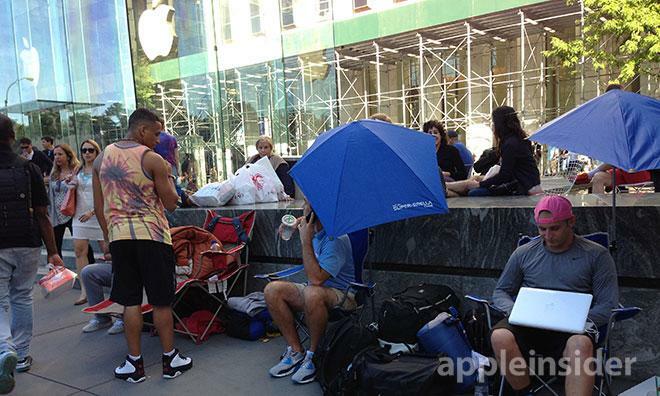 The first iPhone line waiters have already staked their claim outside New York's iconic Fifth Ave Apple Store, camping in front of the shop's jumbo glass gemstone a full four days before the company will formally acknowledge the new products exist. 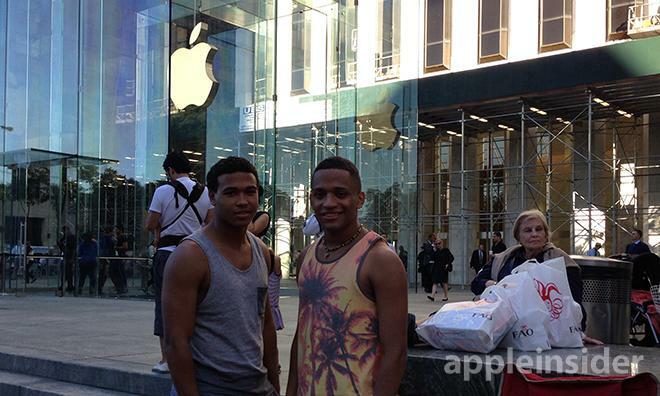 Joe and Brian of Brooklyn, NY were first to queue up Thursday evening for Apple's next iPhone. As of Friday afternoon, a total of four people could be seen waiting in line for Apple's evolution in mobile computing, even though the company has yet to officially announce some basic, yet semi-critical details such as how much the device will cost and precisely when you'll be able to walk out of a store with one. 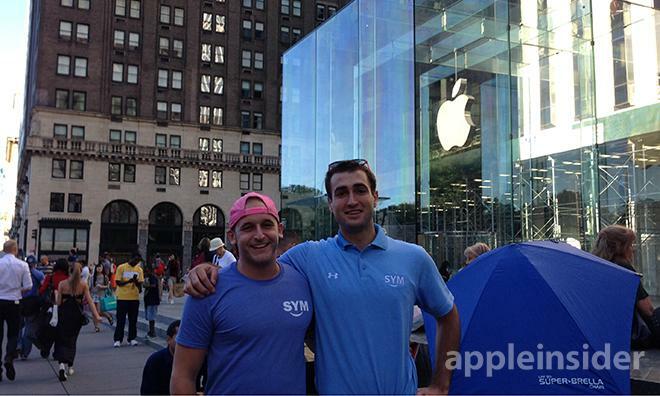 Die-hards Joe and Brian —both local New Yorkers from Brooklyn —are currently first in line. They told AppleInsider they checked the weather report before rolling up Thursday night and pitched their camping chairs, preparing for the long haul. Both were adamant that they had no plans to skirt unspoken line-waiter law and therefore wouldn't be taking turns holding down their fort or deviating from their spot —except when nature calls, that is. Justin and John will sacrifice their hygiene indefinitely to help promote employer SellYourMac. When asked what they plan to do if Apple doesn't release the devices to consumers until Sept. 20th —a full two weeks away —Joe and Brian simply shrugged their shoulders and said: "We'll wait!" The same was case two chairs down, where Justin and John of Cincinnati's SellYourMac.com —clearly on a promotional assignment —sat flanking a stack of knapsacks, sleeping bags and bare essentials. Like Joe and Brian, both appeared to be relishing the onset of the line-waiter experience and were in the process of concocting a plan that would hopefully keep them connected before their initial charges ran dry. Apple is scheduled to hold a media event next Tuesday, at which the company is widely expected to unveil both a flagship "iPhone 5S," as well as a lower priced "iPhone 5C" model. Rumors point to a Sept. 20 rollout, as major U.S. cellular carriers issued blackout periods for employees on and around that date. Lending further credence to the release estimate, AppleInsider reported in August that Apple support personnel have also been restricted from taking vacations from Sept. 15 through 28.